FLASHBACK: Harvard's Joseph Quashie, right, fends off a Caribs player in a TT Rugby Football Union championship clash at the Hasely Crawford Stadium, Mucurapo, earlier this year. CARIBS Rugby Football Club won their first sevens tournament of the season recently, when the "Beer Boys" defeated overall sevens series champions Exiles 26-14, in the final of the TT International Sevens hosted by Harvard, at St Mary's College Ground, Serpentine Road. Caribs finished top of Group B, winning their three matches against Trinidad Northern (26-5), Harvard (21-0) and Harvard II (37-0). It meant an automatic berth to the final, where they would meet the other unbeaten team and Group A winner, Exiles. 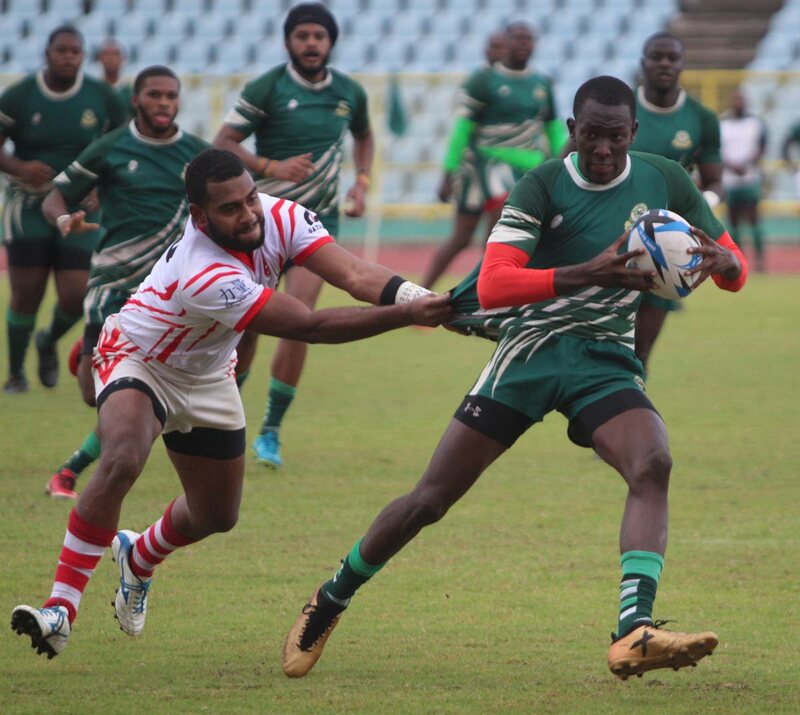 The Harvard Sevens event marked the end of a five-part sevens series sanctioned by the TT Rugby Football Union, starting with the UWI Sevens staged early last month. Exiles won the men's division of the UWI Sevens, and followed up one week later with the YTC Sevens crown. Harvard captured the third leg hosted by Police, and Rainbow won the tournament hosted by themselves in Marabella in the penultimate leg two weeks ago. At the end of the Sevens series, Exiles finished on top the standings with 57 points, followed by Caribs (53 points), who placed third in the first three tournaments and runner-up in the penultimate event. Rainbow earned 48 points to finish third, followed by Harvard (41 points) and Northern (35 points). The women's sevens series belonged to one team: Police. Undoubtedly the dominant force in women's rugby for years, Police ended the series having not lost a single match at any leg of the series. Police women's team have won all matches in all formats this year. According to records, the club's unbeaten run appears to have lasted over the course of several seasons. Police ended the sevens series with 30 points, ahead of Defence Force (19 points) and Royalians (18 points). The Harvard Sevens also brought a close to the clubs' Under-19 male and female tournaments. Harvard defeated Northern 27-15 in the final of the Male Under-19 tournament. That, however, was insufficient to see the team move into the top-three in the final standings. In the end, Northern emerged overall Under-19 champions with 26 points, followed by Royalians (23 points) and Exiles (19 points). In the Female Under-19 competition, Harvard finished behind Royalians in their own back yard but still emerged overall champions with 11 points. Royalians ended with 10 points and Rydues took third with four points. Reply to "Exiles crowned TTRFU series champs"